The Knowledge, Experience, & Resources to Make Your Commercial Job a Success. 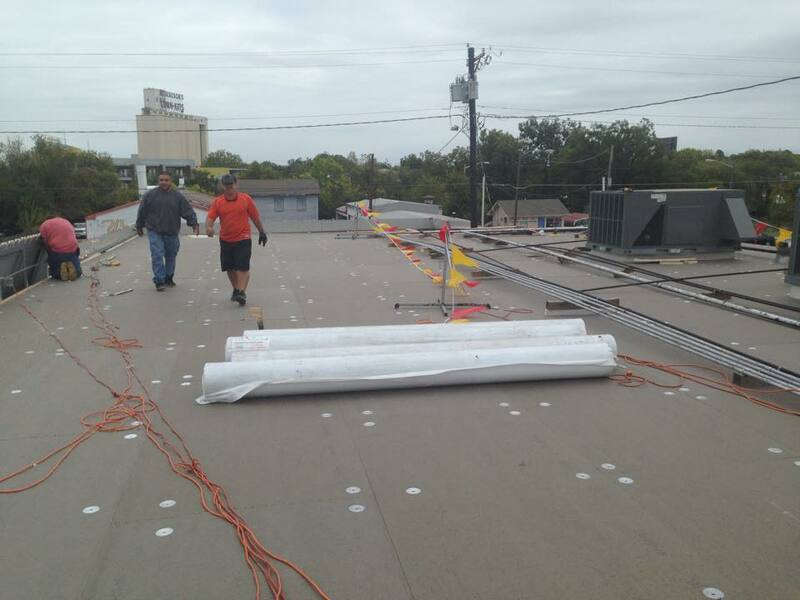 LB Roofing & Construction has the experience, knowledge, and staff to deal with any size commercial roofing project. When it comes to commercial roofing materials or products, there are eight different types of roofing systems all with their own different performance qualities and characteristics that provide advantages and disadvantages depending on the needs of your property(s) structural type and location. There are built-up roofs (BUR), modified bitumen, steep slope, metal, roof coatings, thermoplastic single-ply membranes (TPO / PVC), and thermoset single ply membranes like (EPDM). LB Roofing & Construction has installed, maintained, and repaired each type of roofing systems over the years and we have acquired the experience and knowledge that it takes to intelligently diagnose any situation. If you are in the market for a new roof, selecting a quality roofing contractor is just as important as selecting the best type of roofing system that your building needs. There are a lot of roofing contractors that know how to install most of these types of roofing system(s) but not all have the experience to know what factors to consider when selecting the best type of roofing system for your building’s needs. Built up roofs (BUR), sometimes referred to as a tar and gravel roof, is the oldest and the most common type of flat roofing system. It is made up of hot asphalt and multiple plies of roofing felt. The felt is embedded into the asphalt while it is still hot. This process is repeated until the required amount of plies is achieved. Most buildings have anywhere from three to five plies. The next step is the flood coat and gravel. A flood coat is then applied over the entire roofing system and gravel is casted over the top of the flood coat. Some of the gravel will be embedded in the flood coat and some will be loose laid. The gravel protects the roofing system from UV exposure. This type of roofing system can last the lifetime of the building if installed properly. It performs well in areas that may be subject to falling tree limbs or frequent hail storms. This type of roofing system can be very expensive because of the unstable prices of asphalt. Steep slope roofs is a category of roofing systems that include asphalt shingles, wood shingles, wood shakes, slate, tile, and standing seam metal. Depending on the style of your building, structural capabilities, and the budget you have in mind, any one of these systems can be a good fit for your property if you have a roof with steep slopes. They usually have fewer problems with roof leaks because of their ability to quickly shead water. The installation can be very difficult and much more expensive because of the extra equipment needed in order to have good access to the roof. There are a multitude of different types of low slope metal roofs for commercial buildings. Standing seam, corrugated panels, trapezoidal panels, concealed fastener systems, and mechanical seams just to name a few. Depending on structural layout of your building and uplift requirements, the type of system can be narrowed down to just a few types. Low slope metal roofs have a low life cost and are easy to maintain. They are also light in weight which in turn places low demand on the buildings structural support system. Metal roofing products come in a wide variety of materials and colors. Whether your goal is to have a low cost, low maintenance, or environmentally efficient approach to roofing, low slope metal roofs just make sense. Single ply roofing systems have increased in acceptance and grown in popularity over the past 30 years. Single ply roofs are flexible, easy to install, and very competitive on pricing. Single ply roofing systems are categorized into two groups. Thermosets and thermoplastics. Thermosets are the type that cannot be heat welded because the high heat will alter the membrane characteristics. Thermoset membranes are made from rubber polymers. The most common used is EPDM (ethylene propylene diene monomer). EPDM membranes are known for their long lasting weathering ability and perform very well in large fluctuating temperatures. Thermoplastics can be hot air welded together to form a cohesive lap. PVC and TPO are the two most common types of thermoplastic single ply membranes. These membranes are typically light in color and reflective to UV light which will result in energy savings. They can be mechanically fastened or fully adhered. The fully adhered method will resist wind uplift considerably more than mechanical attachment but can be more difficult to install. Check Out Our Commercial Roofing Photo Gallery!